Paris, December 28th, 1910. All Parisian high society is here for the most talked-about event of the year: the grand opening of the Lutetia Hotel. This Art Déco building is mind-blowing, with its stone balconies blending into the façade, harmonically reflecting the cornices, its angels, grapes and lattices, its silver and crystal letters. It is even avant-gardist, with its decorative glass and steam symbolism. Pillars of hot-riveted steel make the foundations, echoing the iconic tower of Gustave Eiffel, who participates as the engineer of the hotel. Louis-Hippolyte Boileau had previously built Le Bon Marché, Paris’s first department store, which is located just across the square from the new building. Beyond the aesthetic coherence of these two landmarks, the idea is to lodge in the hotel the suppliers, customers and aficionados of the store. The nine-floor splendid structure at the corner of rue de Sèvres and boulevard Raspail claims its crucial role in the City of Light with its name, “Lutetia”, which the Romans used, in ancient times, to call Paris. It soon becomes the number one place to stay in the city, and the centre of the Left Bank’s artistic, literary and intellectual life. A place where Jean-Paul Sartre debates existence over essence with the philosophers, students and teachers of the nearby Sorbonne; where Albert Cohen escapes to write his masterpiece, Belle du Seigneur; and where Ernest Hemingway and the American “lost generation” writers meet for whisky late night, hoping to catch up with Joséphine Baker. As fascism and communism forces dissidents from all around Europe to leave their country and come to Paris, these new immigrants from Germany, Russia, Italy favour their new home city, where they feel free to express their views. When the Second World War starts in 1939, the hotel makes it a priority to accommodate as many refugees as possible. In fact, when German forces bear down on Paris, Charles de Gaulle himself, who had spent his wedding night in the hotel, holes up there for a little while. He escapes with a few residents, while others are captured by the Germans. In the next twist in its long history, the hotel is requisitioned by the infamous Abwher (counter-espionage agency), favoured by occupation officers and French collaborators for its atmosphere and parties. At the liberation of Paris, in 1944, American and French forces take it back and, on De Gaulle’s order, use it as the main receiving station for concentration camp survivors, who receive medical treatment, identity papers, food and clothing. Many others come there every day, waiting for their beloved ones to appear. While most of them give up after a while – understanding there is no hope anymore – a mother comes one day, seeking her 21-year-old son and insisting he will be arriving soon. A few hours later, Georges Charpak, a Dachau inmate, opens the hotel door. Fifty years after, he would win the Nobel Prize in Physics. 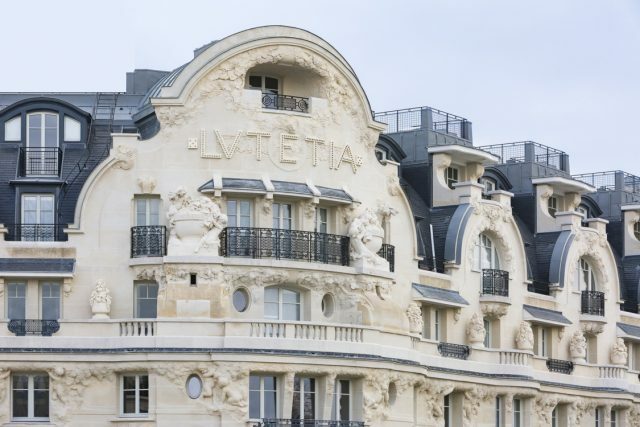 The Lutetia remains this melting-pot place for the rest of the 20th century, with aficionados such as Albert Camus, James Joyce, Samuel Beckett and Juliette Gréco, as well as David Lynch, Serge Gainsbourg, Gérard Depardieu and Catherine Deneuve, amongst others. No wonder it is regarded as such a Parisian icon. 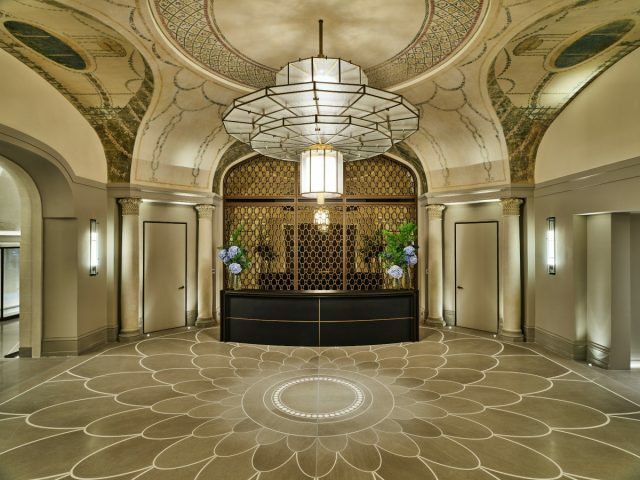 Recently closed for a renovation that lasted four years — the first closure in its long history — the Lutetia has now reopened, refurbished and rethought throughout, though its heritage preserved. 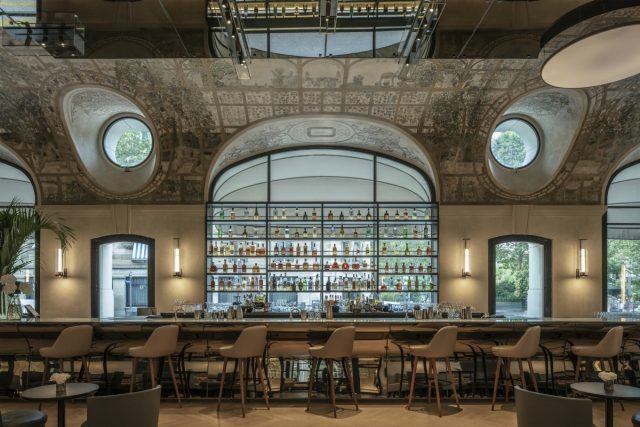 “The challenge facing us was to breathe new life into an establishment while respecting its roots, its identity, and its personality,” explains the architect of this Renaissance, the internationally renowned Jean-Michel Wilmotte. This ambitious renovation, beyond the new layout of the ground floor and the seven new signature suites, is driven by light. For instance, a new interior patio brings more daylight into the building, while offering a charming view of the façade. Then there’s the new state-of-the art spa, stunning indoor swimming pool and the return of locals’ favourite, Brasserie Lutetia, headed up by the three-Michelin-starred chef Gerald Passedat. All of which is only fitting for this Grande Dame of the Left Bank.